Use Hoffmans Digital Dream Big panel to create this fantastic bag! This basket is a great addition to all your storage needs. Fill the baskets with candy, baby toys, balls of yarn, or decorative gizmos & gadgets. 5" wide, 9" long, 6" tall finished. A great tree to hang charms on with pictures of your family or add a star on top to make it a Christmas Tree. 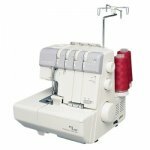 Have a serger and don't know what to do with it? Can't thread it? Can't convert from a 3- thread to a 4- thread & back? Then this is the class for you! Enjoy stitching up these sweet little zippered pouches. They feature a quilted base for stability and a see-through vinyl top so you can say hello to all your treasured trinkets. Pattern includes instructions to make all four sizes. Rug made out of one Jelly Roll and 2 rolls of Basal batting. Open Sew is the perfect time to finish up those UFO's you have lying around the house. Pack up your sewing machine and unfinished projects and join your fellow sewing buddies! Super simple construction using one block and simple step and repeat. Finished size 24". 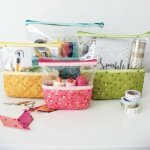 Learn a technique on your serger while making a cute project! Spring is finally here so let's make a really fun windsock to hang outside! Susan has taken a new coordinate of bright fun fabrics & made them vinyl coated for better weather protection. Vinyl coating is optional!